Can the Daily Mirror reassess the quality of its “Manchester United” insiders” who were “convinced” Jose Mourinho was going to be sacked last weekend? The paper leads with United’s 3-2 win over an average Newcastle side lacking in top talent, hailing it as a “stay of execution”. The comeback from 0-2 down “papered over the cracks”. David McDonnell saw United play for 70 minutes “without spark or purpose”. They were “abject”. But “from somewhere deep within themselves”, the players stirred for a “staggering Fergie-like 20-minute comeback”. It was a “miracle”. No word on Mourinho’s role in the resurgence. Not a peep about what the manager might have done at half-time to reform his side trialing by two goals. 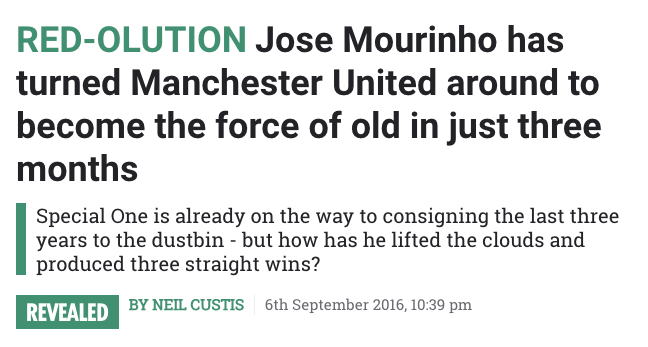 And nothing said on the Mirror’s story, as told by one David McDonell, that Mourinho is today looking for a new job. As the Mirror memory holes the words “Mourinho Jose Mourinho set to be sacked this WEEKEND whatever Manchester United’s result vs Newcastle”, the Sun has its own exclusive. 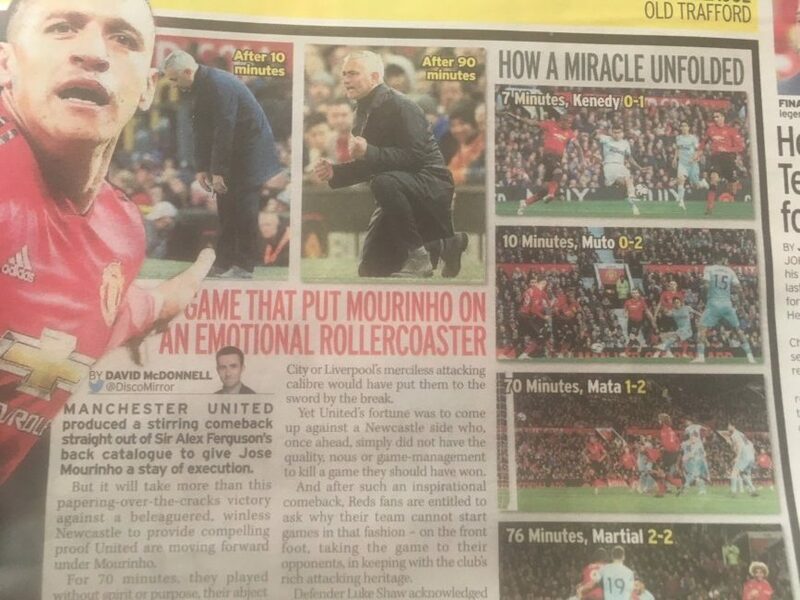 The Sun is the paper that has cheered longest and loudest for Mourinho. The team might be dull, but to the Sun it’s all part of the “RED-OLUTION”. 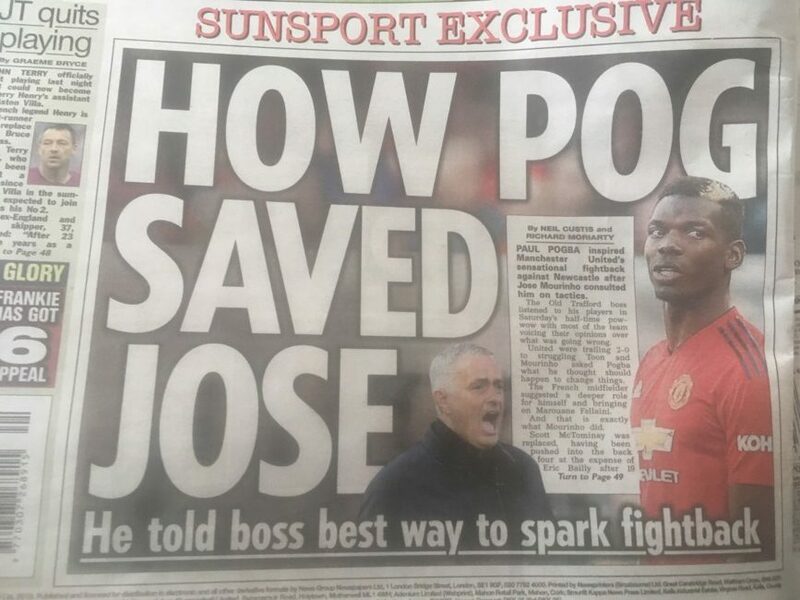 And so to the day’s scoop: “HOW POGBA SAVED JOSE”. The want-away midfielder saved Mourinho, how? “He told boss best way to spark fightback.” Pogba Tip 1: Tell Juan Mata to score direct from a free kick. Mata scores! The trust is less poetic. We hear that Mourinho listened to his players at half time. Pogba suggested a “deeper role for himself and brining on Fellaini”. Genius. Bring on the hairy elbow and lob it up into the mixer. Mourinho tells everyone that he and the team chatted for 10 minutes about this and that at half time. To seasoned Mourinho watchers this might look like the manager trying to exculpate himself from the mess. But to the Sun’s it’s honest Jose binding the team and securing victory. It “showed how they could all work together”. It also showed that Newcastle United – six defeats from eight played; two draws – can’t hang on to a two goal lead.